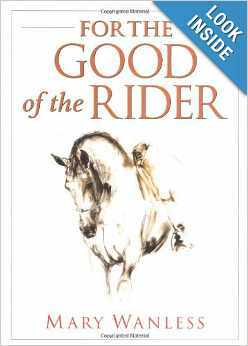 Endurance.net's book of the week is For the Good of the Rider, by Mary Wanless. In this book, Wanless conveys the 'how' of riding, allowing the rider to understand and make use of the biomechanical principles that underpin good riding at every level. Wanless has spent almost 20 years developing teaching strategies to enhance riding performance and eliminate the difficulties which beset so many riders today. Her methods, renowned for boldly cutting through the conflicting advice so often given to riders, make talented riding a possibility for all. She explains that behind the art of riding lies a science, which has laws of cause and effect. Utilising these laws turns the rider's body into a sophisticated tool for infulencing the horse, allowing her to mimic the techniques which gifted riders unknowingly use.